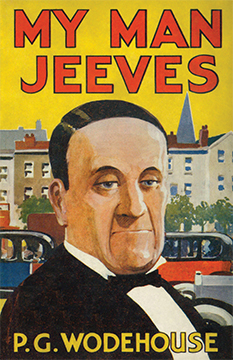 The book My Man, Jeeves, published in 1919, was Wodehouse’s first book with the name Jeeves in its title. The book includes four stories about Wodehouse’s most beloved characters, Bertie Wooster and Jeeves, with illustrations by Alfred Leete, who did a wonderful job of defining the characters of Wooster and Jeeves visually. It also includes four stories about Reggie Pepper, an earlier prototype of Bertie Wooster, with illustrations by Joseph Simpson, H. M. Brock, and Charles Crombie. The stories collected in the book were published earlier in the Strand magazine in Britain and in the Saturday Evening Post, Collier’s Weekly and Pictorial Review in the United States. This edition reproduces the stories as they appeared in the Strand magazine, allowing today’s reader to experience these stories in the same way their earliest readers did. Sir Pelham Grenville Wodehouse (1881-1975) was an English humorist who wrote novels, short stories, plays, poems, and lyrics for musical comedies. He was immensely successful with the public and was also admired by writers such as Rudyard Kipling, Hilaire Belloc, and Evelyn Waugh. Today, he is remembered mainly for his writings about Jeeves and about Blandings Castle. Heritage Facsimile Editions are reproductions of classic works of literature as they first appeared in illustrated magazines. In the days before electronic media, illustrated magazines were one of the most common forms of popular entertainment, filled with stories and serialized novels. The illustrations were a key part of the reader’s experience. There was a delay before these stories and novels were published in book form, to give people an incentive to subscribe to the magazines. The books kept down costs by omitting the illustrations. This series publishes the books using facsimiles of the magazine articles, including the original illustrations.